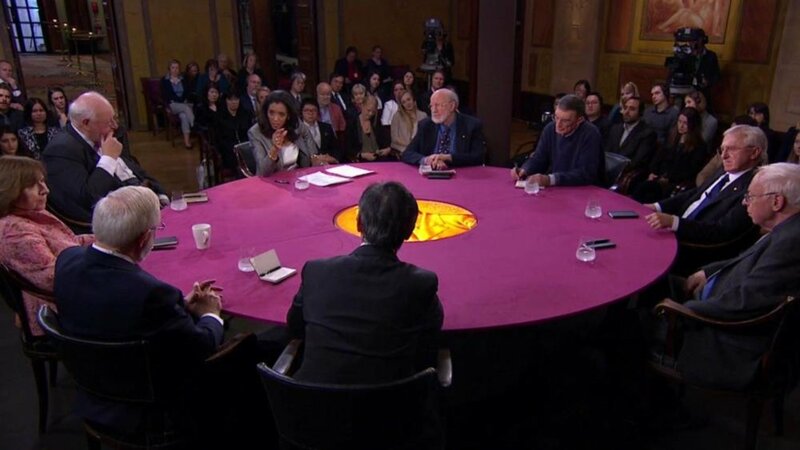 The 2015 Nobel Laureates met at the Grünewald Hall in the Stockholm Concert Hall in Stockholm on 11 December 2015 for the traditional round-table discussion and TV program ‘Nobel Minds’. The Nobel Laureates discussed if prizes inspire unnecessary competition, if it’s possible to fight inequality; the discoveries for which they’ve been honored and how these can be applied in a practical way, and what motivates them in their work. The discussion was hosted by Zeinab Badawi of the BBC. Telephone interview with Svetlana Alexievich, following the announcement of the 2015 Nobel Prize in Literature, 8 October 2015. The interviewer is Julia Chayka, and the following transcript is an English translation of the conversation in Russian. (Julia Chayka) Hello, my name is Julia Chayka, calling from Nobelprize.org, the official website of the Nobel Prize. I am honoured to congratulate you on the award of this year’s Nobel Prize. (Svetlana Alexievich) Thank you very much! (JC) You probably already know that you have been awarded a prize, do you? (JC) Hopefully you have 2-3 minutes to answer several questions. This interview will be recorded and later on will be available on our website together with the interviews with other Laureates of the year. (JC) We would like to ask you about you reaction, what are you feelings about the Prize? Or is it too early to ask such a question? (SA) [laughs] It is, indeed, but I can describe how I feel right now. Of course, it’s a joy, it would be strange to hide it. But it makes me anxious as well because it revived all these great shadows: Solzhenitsyn, Bunin, Pasternak, all the Russian Nobel Laureates in literature. Belarus never got a Prize. It is of course an anxious feeling to realize that neither tiredness nor disappointment may let me lower the bar now. It’s been a long way, a huge work has been done and something new is waiting for me. (JC) Thank you for these beautiful words. Now coming to your writing style, may I ask you what influenced you when you chose this kind of journalistic approach in your works? (SA) You know, everything happens so fast and intensively in the modern world that neither one person nor the whole culture are able to conceive it. It is just too fast, unfortunately. There is no time to sit and think it over, as did Tolstoy, whose ideas matured over decades. Every person, me too, can only try to grasp a small piece of reality, conjecture only. Sometimes I leave only 10 lines out of 100 pages of my text, sometimes one page. And all together these pieces are united in a novel of voices creating the image of our time and telling what is happening to us. (JC) You’ve just used a stunning metaphor a ”novel of voices” and my next question is connected to this. You have witnessed enormous suffering and seen awful evidence in your work. Has it influenced the way you look at a human being? (SA) It may take some time to answer this question but I should say that I belong to the culture that constantly has this degree, this painful temperature. Something that is incomprehensible and unbearable in other cultures is a normal condition for us. We live in it, this is our environment. All the time we live among victims and executioners. In every family, in my family … the year of 1937, Chernobyl, the war. It can tell a lot, everyone has these stories… every family can tell you this novel of pain. And it’s is not that I have this point of view or that I like how people think in such situations. No, it is our life. Imagine a person who emerged from a madhouse and is writing about it. Should I tell this person: ”Listen, why are you writing about this?” Like Primo Levi, who wrote about concentration camps and couldn’t tear himself away from them, or Chalamov who was overtaken and killed by the camp, he just could not write about anything else. I myself have been wondering who we are, why our suffering cannot be converted into freedom. It is an important question for me. Why does slavish consciousness always prevail? Why do we change our freedom into material benefits? Or to fear, as we did earlier? (JC) Whom are you writing for? (SA) I think that if I can understand these questions myself than it would be easy for me to speak to anyone. Both on scene or when I am writing I wish to have a feeling of talking to nearest friends. I wish to tell them what I realised in this life. I never accept the role of a judge, I am not a cool chronicler. My heart is always there. The question that worries me is how long we can walk this road of horror, how much a human being can bear. That’s why the poetics of tragedy are important for me. It is important when somebody says that he or she has read such horrible books and feels better, that a reader got tears and these were purifying tears. You should have all this things in mind and not just overwhelm people with horror. (JC) Thank you and please accept our congratulations once again. We will be happy to meet you here in Stockholm in December! (SA) Thank you, good bye!